Nikon released a new addition to its entry-level DSLR lineup on Monday, the D5100. The 16.2-megapixel camera has an adjustable LCD screen, continuous auto-focus in movie mode, a maximum ISO of 25600, and a new Special Effects mode with four filters that work on both still images and movies. 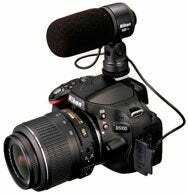 The $800 D5100 is an update to the $630 D5000 that was originally released in April 2009. The D5100 falls between the D3100 ($700) and D7000 ($1200) in Nikon's current lineup. It combines features from both models and throws some beginner-friendly creative modes and filters into the mix. The D5100 has the same ISO range (100-6400, expandable up to 25600) and 16.2-megapixel, 23.3 by 15.6mm CMOS sensor as the D7000. In continuous shooting mode, the D5100 can capture up to 4 frames per second (fps). Weighing in at 18 ounces, the D5100’s body is light and small like the D3100. The newest features on the D5100 are largely aimed at users who want to shoot movies with their DSLR. It captures 1080p and 720p movies at 24 or 30 fps. The 3-inch, 921,000-dot LCD screen can be flipped out and tilted up to 170 degrees, which is key for using the movie mode and Live View. The new Special Effects Mode on the camera's mode dial gives users four filters that can be applied to movies as well as still images: Selective Color, Color Sketch, a tilt-shift effect, and Night Vision, which boosts the ISO to 102400. The D5100 has the ability to continuously auto-focus while in movie mode—a feature that made its debut in the D3100. One known drawback of this feature is that it generates a loud noise that is picked-up by the in-camera microphone. To help address that issue—though at an additional cost to consumers—Nikon is is releasing a new external microphone called the ME-1 that fits into the camera's hot shoe mount and plugs into the mic input port. It is designed to compensate for most of the noise created by the lens auto-focusing. The ME-1 microphone will be sold separately starting in April and cost $180. Available in mid-April, the D5100 will cost $800 for the body only, or $900 with a kit 18-55mm VR lens.